One half food photography, one half wine and cheese education and pairing – this post has details on a new cheese shop in Indianapolis and insider tips on Indiana wines from experts in the business. I have so many cool things to share with you here today! Last week I had the pleasure of attending a food photography workshop featuring Lindsay from Pinch of Yum, thanks to Indiana Family of Farmers, Indiana Dairy and Indiana Wines, the awesome partners who support local bloggers like myself. 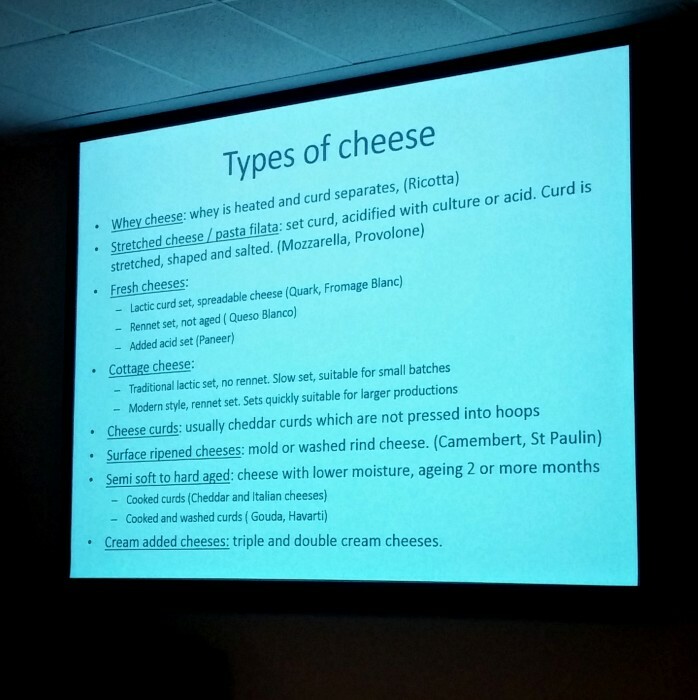 They also gave us an interesting education on how cheese is made to where you can buy great quality cheese in Indianapolis, including a sampling of cheese paired with Indiana wines. Don’t worry, we started with the serious photography portion AND ate lunch before we cracked open the first bottle of wine. Lindsay and her husband Bjork have been running Pinch of Yum for over 5 years, creating recipes that are not only delicious but have stunning photos that are simple and not overdone. They all look flawless and beautiful, and they make me hungry! Photography is a skill I am constantly working to improve. I started a series of food photography posts to discuss the process of how I create photos for my recipes. First, I talked about choosing the right camera, then I talked about how to work with lighting – and soon, I’ll talk about how I pick different props and decide what the composition of the photo will be. My degree in art history shines here because those years of analyzing paintings and sculptures allowed me to understand what makes an image visually appealing. Those same tools apply to food photography. Though one thing I love to do is attend workshops so I can learn from others, ask questions and continue to improve my craft. This was Lindsay’s first food photography workshop and she did a great job! She has a food photography e-book titled Tasty Food Photography and she really knows what she’s doing. She was also an elementary school teacher – I say “was” because she recently just left her job to become a full time Pinch of Yum-er. How awesome is that? We started the workshop with a round robin to hear about each attendee in the audience. All of us were local Indiana bloggers who have either started using a DSLR camera and want to learn about how to move from Auto to Manual settings, or we have some basic understanding of manual settings and wish to know more about how to use them better. While I only shoot photos on a manual setting now, I still need help translating what problems I run into and I wanted to know more about what settings Lindsay uses with her camera. Lindsay did a fantastic job of explaining aperture, ISO and shutter speed settings – from what they mean to how certain settings are better than others specifically for food photography, each example was thorough and her analogies for how they work were quite helpful. We also watched her set up a photo shoot for some chocolate cookies. She has a beautiful wooden board that she uses for most of her photos. Thanks to the room we had, there were floor to ceiling windows that let gorgeous natural light in. We watched her set up the composition of the plate with the cookies and the glass of milk, followed by a discussion of what settings were best for natural light. Once she snapped a photo, it showed up on the projector screen so we could view and analyze it. After Lindsay had us feeling confident and snap happy, we were allowed to test our settings and skills by using a number of food items, plates and bowls to set up our own scenes. The natural light in the room was beautiful and something that I would not have at home. My home has a dark kitchen and dark walls that are not conducive to the ideal food photography set up. However, they still applied to the lighting set up that I use at home. I was keeping my ISO far too high for the amount of light I was getting with my artificial lights. At the end of the workshop, Lindsay opened it up for questions. I had a few burning items on my mind to ask her advice on. The first was about watermarked photos – mine are, Lindsay’s aren’t. Her answer was simple and kind of what I expected. Lindsay’s got a team that can help her take down some of the sites where her photos have been copied and pasted elsewhere with full recipes. Yet it’s going to happen and she doesn’t let it get to her too much, which I appreciated hearing. That and I don’t think she likes the way they look on a photo. I can agree – it can attract the eye more than the photo and there isn’t always a good place for them. I do it, but I’m considering leaving them out from now on. Same goes with the text over photos to help clarify what they are. They don’t always work. Second, I asked about time – how long does it take her to produce a post from the recipe development phase to the final published product? Her answer was anywhere between 2-3 hours to make it and 2-3 hours to photograph and publish, sometimes longer depending on what the recipe is. I figured it was as much or more, which is helpful to hear. It does take quite some time to get each recipe ready for publishing. Photographing the food can be the longest part if I made a party dip, whereas some recipes take longer than the photographing or editing part. Third, I asked about whether she has edited or taken new photos of the recipes from the beginning of Pinch of Yum. She has not, unless it was a recipe that was good enough for bringing back to life or using for a client. She compared it to how as her food photography has grown, so has her level of cooking. I can agree with that. While I’ve edited a few older posts, it is because I wanted to share the recipe again or it was getting a lot of traction on Pinterest. What did I take away as action steps from Lindsay’s 2 hour presentation? Lower my ISO and soften the white light for my photos to emulate more natural light settings. To achieve a lower aperture, I’m going to need a new lens. Yup, the kit lens on my Canon T3i cannot get any lower than f/4.0 and sometimes f/5.5. I can definitely work with what I have but I would like to obtain said lens at some point. Food props can be uber simple. I’m making them out to be more difficult than they should. Lindsay’s e-book Tasty Food Photography touches more on this subject. To spend more time practicing with different light set ups. I usually spend more time thinking about how to photograph the recipe than I should. I tried this with my Backyard Blackberry Ice Cream recipe (since ice cream melts fast and is difficult to work with) and it ended up getting picked up by Foodgawker! I highly suggest purchasing Lindsay’s Tasty Food Photography e-book so you can read the details on her settings and how she achieves such beautiful photos and follow Pinch of Yum to get inspired for creating new recipes and great photos to go with them. After Lindsay’s session, we broke for lunch and then followed it with a session on cheese making! There was also an empty wine glass on the table for us, which intrigued me. That Indiana Family of Farmers group is always coming up with exciting educational opportunities for us! This is Fons Smith with Tulip Tree Creamery. Fons grew up in Friesland in the Northern Netherlands and knows a thing or two about cheese. From there, Aaron Bronson, a Division Murray’s Cheese Specialist for Kroger, gave us a glimpse into the world of cheese that is available from their stores, which have just come to Indianapolis within the last year. Even – get this – Mizithra cheese! I’ll explain more about it later, but this cheese has been difficult to find and cannot be substituted for how I want to use it. Each Murray’s Cheese location in Kroger will have 7 or 8 specialists in red coats who have completed extensive cheese training to be able to help you understand the wide variety of cheese they offer. Man, what a tough job, eh? Cheese training. Interested in checking it out? Head to Kroger at 1217 Rangeline Road for the grand opening of another Murray’s Cheese on June 19! B105.7 will be there from 11 AM – 1 PM giving away gift cards, which you will likely need because I have a feeling we are all going to buy our weight in new cheeses. And then came the wine. Jeanette Maple Merritt wears many hats, but they all have one thing in common: a love for wine. Specifically, Indiana wine. In front of us were pieces of paper with names of grapes I didn’t know, tasting notes and a list of cheeses that we would be sampling with different wines. Jeanette walked us through it with the ease of a professional who clearly knows her wines. Indiana Wines provided the five wines we would taste while Indiana Dairy provided the five different cheeses. (Shout out to these sponsors for bringing Pinch of Yum to Indianapolis, too!). Recently I wrote about the Indiana Uplands Wine Trail to share just how many wineries are located in southern Indiana and to offer you potential weekend vacation in the hilly, forest landscape that makes up our great state. Jeanette and Indiana Wines work with Indiana wineries to educate the public and market the wines that are being produced and winning international awards. We began our tasting with gruyere and Chambourcin, Indiana’s most widely planted red grape. With each pairing, Jeanette would ask us to taste the wine and note what aroma descriptors we noticed, such as floral, fruity, aging or spicy. Then, Indiana Dairy would discuss the cheese we tried and how it pairs with the wine. Finally, Jeanette would tell us what wine were were tasting. The Chambourcin was from Huber Winery, an 8th generation family-owned winery. Okay, my notes are short. What can I say, I was absorbing everything Jeanette had to say but I’m still so new that wine education needs to be drilled into my skull, but I’m getting there. My favorites were the smoked gouda with chardonel and the pepper jack with catawba (pronounced ca-tah-ba). Both cheeses were mild enough for me to eat without any help from bread or crackers. 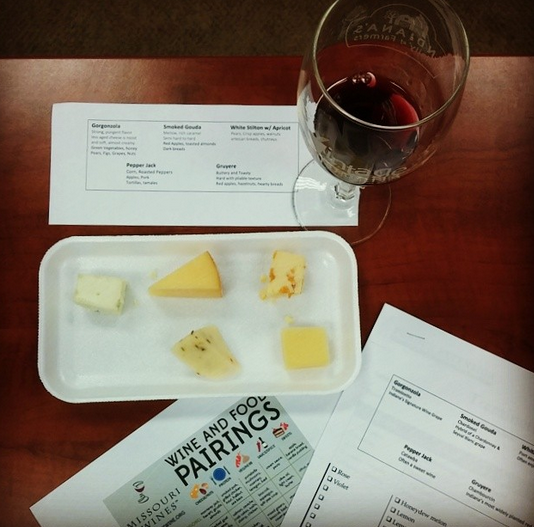 The cheese complemented their wine counterparts well – not something I would be able to do again without my hand outs!